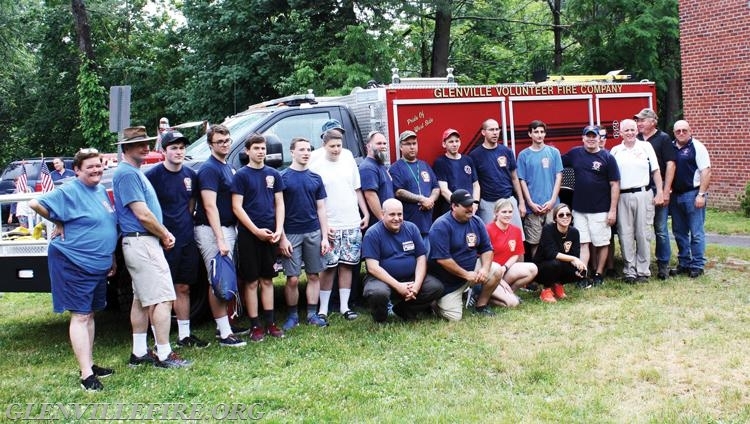 After years of planning and fundraising, the Glenville Volunteer Fire Company officially showed off its new Brush Truck during a wet-down ceremony last week. In a little less than three years, the Glenville Volunteer Fire Company and Fire Chief Michael Hoha raised the $306,000 needed for the new brush truck. According to the fire company, the truck was purchased using funds raised by the volunteers, with no additional impact to the town’s budget. The brush truck is a Ford F-550 chasis and holds 250 gallons of water on board. It also has a 1,250 gallons per minute pump. In addition, the new brush truck has a few structural firefighting lines if needed, and there is 1,200 feet of forced line hose on board and an additional 250 feet of booster reel. There is also a large diameter hose on the truck. The tires on the new truck can certainly get the job done, as they are special off-road 36 x 13.5 inch tires. The aggressive treads allow the vehicle easily to go off road and gain access to hard-to-reach fires. And for Hoha, this is a dream come true…literally. A few years ago, Hoha was camping with his son at Camp Seton, situated out in the furthest camp site. He was sitting outside and eating, looking at the fire pit in front of him, when his firefighter instincts arose. Training for operation of the brush truck is mostly universal. Almost anybody who can drive the engines in town will pick up operation of the brush truck fairly quickly. The Glenville Volunteer Fire Company will have to partake in some basic training in order to become familiar with the truck. While the wet-down ceremony took place late last week, the brush truck has been in operation for nearly a month now. And, it’s already been put to good use. While the brush truck rests in the Glenville Volunteer Fire Company’s garage, it’s not just being used for that side of town. Members of the Glenville Volunteer Fire Company pose for a photo in front of their new brush truck. 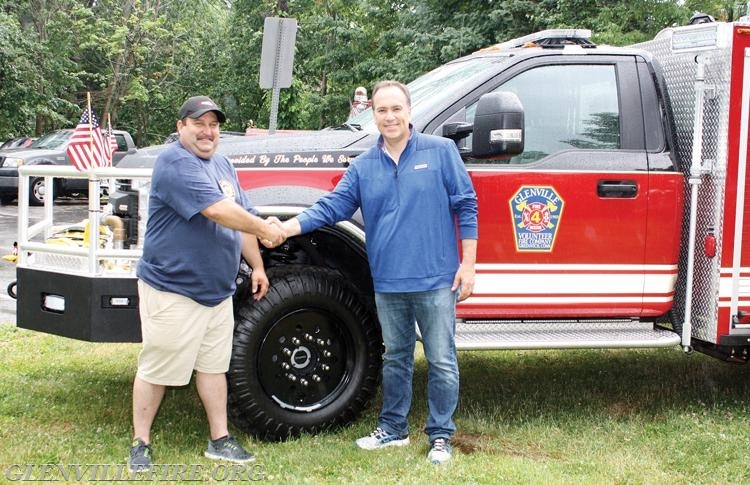 Greenwich First Selectman Peter Tesei helps to officially welcome the new brush truck to Glenville.